This AES cartridge was converted from an arcade MVS cartridge. Note 1: Like dodge ball games? 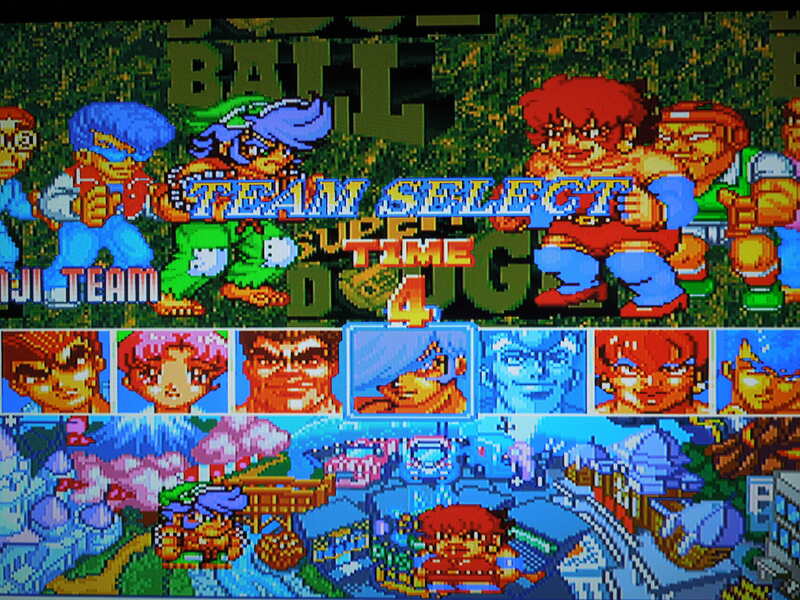 Check out my review of Super Dodge Ball for the PC Engine! 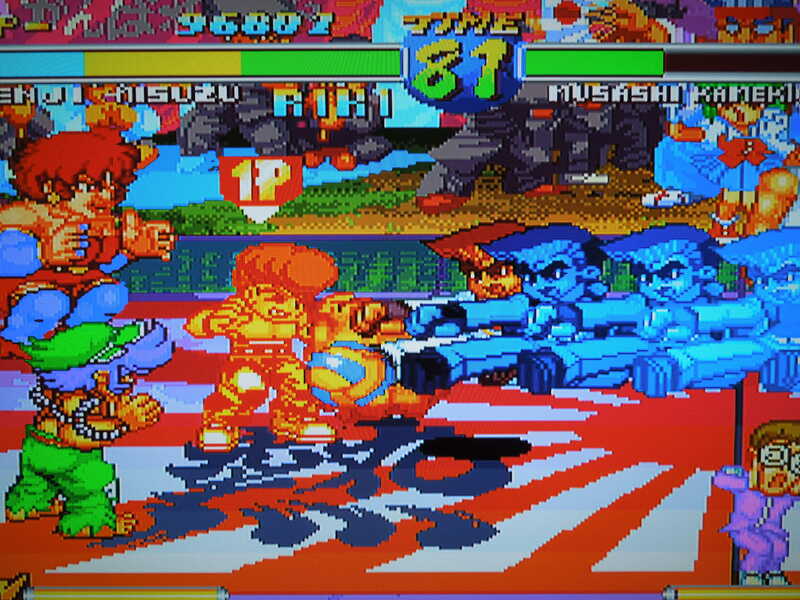 Note 2: This game was played on a Neo Geo AES home console that has been modified to output in component video (red, green, blue). It was connected to a 32-inch HD tv. Quick History: Super Dodge Ball was released for the Neo Geo MVS (arcade cabinet) in 1996. *This game is not to be confused with the original arcade Super Dodge Ball released for arcades in 1987, nor that version’s PC Engine and NES ports. The game stars Japan’s Kunio character, and thus it is another of many games released in the Kunio-kun series. 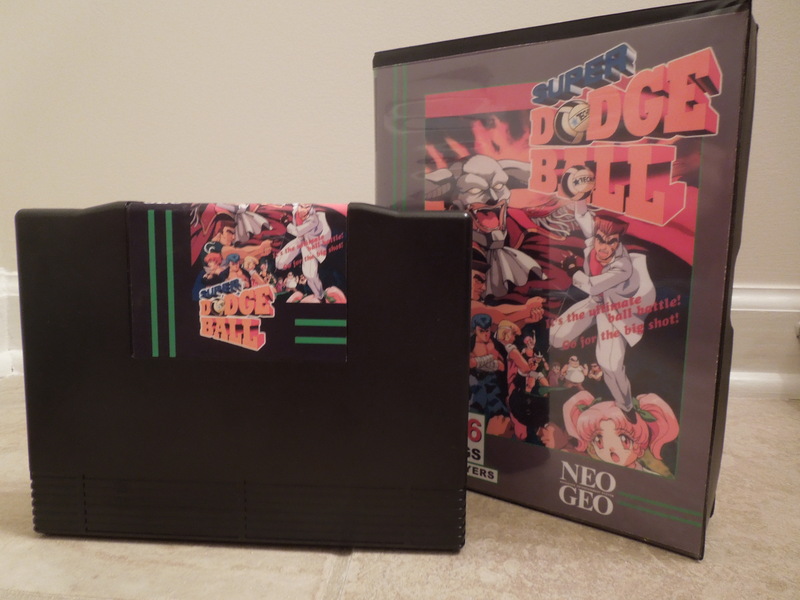 Super Dodge Ball did not receive a release for the Neo Geo AES home console; however, today, modders have been able to take MVS arcade cartridges, remove their boards, and place them into AES home console cartridges – this works because the home versions of games are identical to their arcade counterparts – the only difference was that arcade cartridges were larger than home console ones. Many games that were released for the Neo Geo MVS never received an AES home cartridge, so this ‘conversion’ makes it possible, for the first time, to play these games on your Neo Geo AES. The copy of Super Dodge Ball used for this review was originally an MVS arcade cartridge, but was professionally converted to an AES home console cartridge. Because this game had never received a home release for the AES (and not many people owned an AES anyway), many people have never heard of or seen this game. Story: SDB’s story is one of the all time greats in video game history. D. Maou, the game’s antagonist, used to be a great professional Dodge Ball player, until one of his ‘special’ shots accidentally killed his wife, who was in attendance at the match that day. Since then, he has vowed to wipe Dodge Ball off the face of the Earth…and what better way to do that than…holding a Dodge Ball tournament?! Classic. D. Maou, the game’s antagonist, hates the game of dodge ball. Rules: In Super Dodge Ball, you’ll play 3 on 3 matches. The court you play on is rectangular, with a line down the middle that your team is restricted to. You cannot cross the line, nor can your opponent cross it. The match begins when the referee does a ‘toss up’ of the dodge ball along the center line – both you and your opponent can jump to grab it for possession. The objective is to eliminate the 3 members of the opposing team. Each member of both your team and your opponent’s team has their own health bar. Once a player’s health bar is gone, they’re out. However, if a player is eliminated, he or she then stands on the outside of the court behind your opponents, and you can still pass them the ball, and he or she can still attack if they have the ball – this adds a bit of strategy to the game. Each match has a time limit, and if the clock runs out before one team has eliminated all of the other team’s players, then the team with the most surviving characters (or longest health bar if both have the same number of surviving characters) wins. Also, no team can hold the ball for longer than 5 seconds – if you attempt to, the ball will explode in your hands, and the referee will have to throw it in to your opponent. 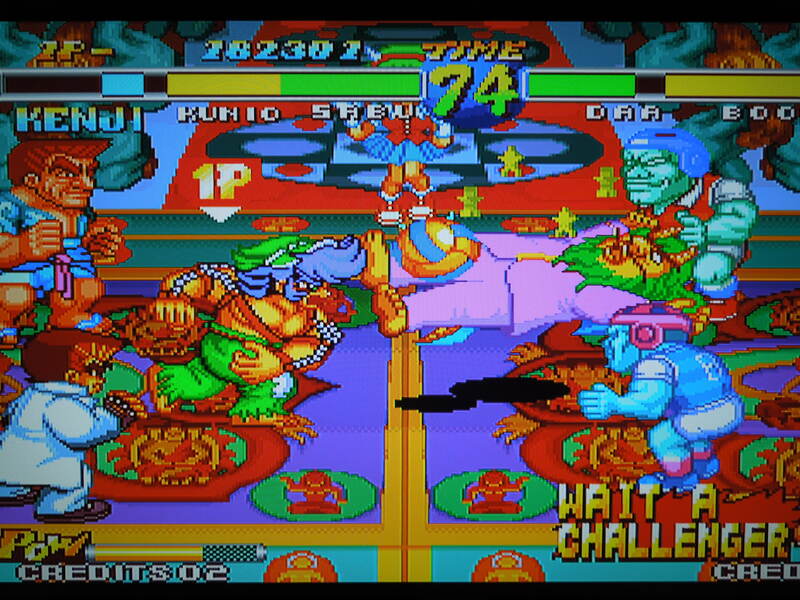 Super Dodge Ball has amazing graphical effects. Control: Once you select your character, a brief ‘explanation’ screen (skip it by pressing Start) will play – here you’ll get the basics. A throws the dodge ball, or catches it when it’s thrown at you (you can catch every shot in the game, but the special attacks and Super Attack can be tougher to catch). Tapping A also makes your character get up faster when knocked down – also tap A rapidly to win possession of the ball if you and your opponent grab it at the same time. B dodges when a ball is thrown at you, or passes to your teammates when you’re on offense. C jumps. D feints (like a pump-fake by a quarterback in football) on offense and taunts your opponent when you’re on defense. Holding A + B ‘powers’ up your character for a Super Attack. There are also more advanced controls that are not listed on the ‘explanation’ screen. If you want to beat the game on the harder difficulties, you’ll need to master these. If you’ve ever played fighting games like Street Fighter II or Mortal Kombat, they’re the same type of moves. There are 7 selectable characters, each with their own unique dodge ball special moves. Forward, Back, Down, Forward, A – team Super Attack when your power bar is full. Gameplay: In Super Dodge Ball, you choose from among 7 characters (or Captains): Kunio, Riki, Misuzu, Shinji, Kenji, Sabu, and Miyuki. Some are quicker but don’t throw the ball as hard, while some throw the ball with extreme velocity but move slowly. Others are a nice balance of strength and speed. All have their own unique special shots and Super Attack. On the character select screen, you can give your character a different color scheme by pressing either A, B, C, or D to select him or her. You execute all characters’ special moves or Super Attack using the controls listed above, meaning you don’t have to memorize different commands for each character, which is nice. Depending on who you choose, you’ll have 2 different ‘sidekick’ characters on your team. 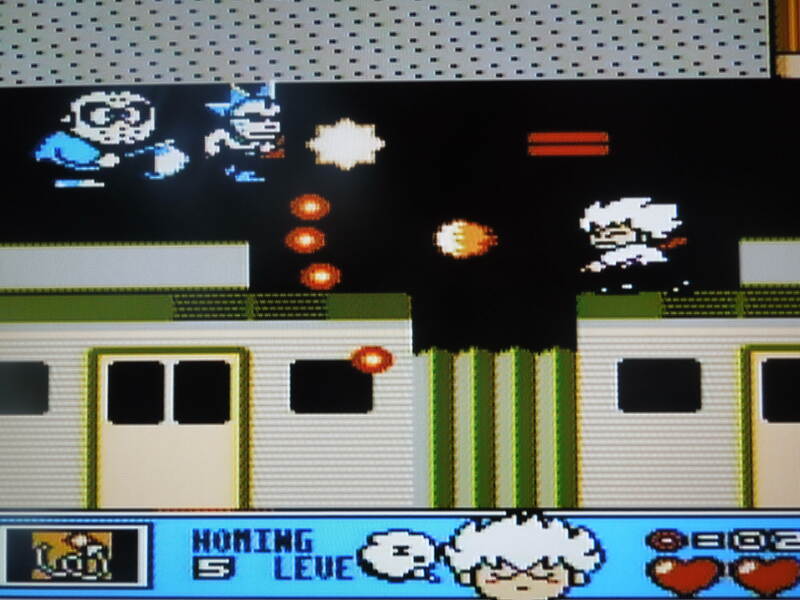 The sidekick characters, by the way, can execute only one special move, special attack 2 (see Control above), and they cannot execute a Super Attack. You’ll play 9 total rounds of dodge ball: one match vs 3 sidekick characters, six matches vs the other Captains and their sidekicks, one match vs a team of 3 Captains, and the final match vs D. Maou and his sidekicks, Daa and Boo. After each match (except the first and last one), you have the option to add the Captain of the team you just defeated to your own team. If you choose to do so, then you’ll loose one of your sidekicks. 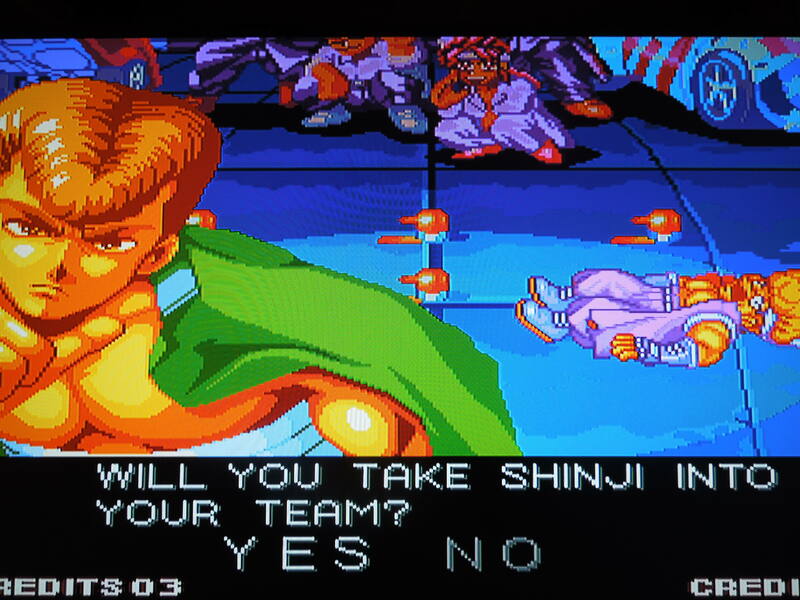 Choose to take another Captain after the next match, and both your sidekicks will be replaced. Once you have 3 Captains on your team, you can still add Captains after matches, but the new one will replace one of your existing ones. You’ll never replace the Captain you started with at the beginning of the game. Each character has 2 special moves. Sound & Music: The music in Super Dodge Ball is great – the intro music (and explosive graphics) will get you fired up to play the game. Each arena has its own theme as well – some are better than others, but they’re all good. The sound effects are some of the best I’ve heard in a sports game. Each special shot has a great sound effect, and the smack of the ball on an opponent’s face is satisfying. Options: Before you begin each game, you can set the Time Limit to your preference: 45, 60, or 99 seconds – working the clock can become part of your strategy for winning a match. You also can select from 8 difficulty levels (1-8), which is great. The game is simple to beat on levels 1 or 2, but you’ll need to master the special controls if you want to win at higher levels. Credits: The game automatically gives you 4 credits (continues). If you lose 4 times, it’s Game Over. However, if you have a Neo Geo memory card, you can save your game after you lose all your credits, and continue where you left off. 2 Player VS: In a 2 player match, you’ll play a ‘Best of 3 matches’ game, rather than just a 1 match game. Both players have the option to select the same Captains, also. After you’ve finished the game, the loser will need to ‘join in’ the game again by pressing Start if you want to continue playing VS.
You can add a defeated team’s Captain to your own team. Strategy: Learning the Super Attack and special moves will help you excel at the game. The ball will often bounce back to you after you connect with a shot, so jumping and then throwing it at your opponent again for additional damage works great. Keep in mind, the computer can also do this. Using the feint (D) button followed by an actual throw is a great way to fake out the computer. Passing to and utilizing your eliminated, outside-the-court teammates is a great strategy too, as you can often hit opponents while their backs are turned (again, the computer does this, too). On the higher difficulty levels, the computer will catch most of your attack throws, so mastering the Special Defensive move (press forward, down, forward, A when the ball is thrown at you) is the best way to attack – this makes your character deflect an opponent’s attack shot right back into his or her face! So, where can I find this game? Remember, this game was never officially released for the Neo Geo AES home console, so you’ll want a conversion to play it this way. You can do a Google search for some Neo Geo sites that sell conversions or take special orders, or you may occasionally see the AES conversion on Ebay. Also, you could always buy an MVS home-made console (where the maker basically takes parts from the arcade machine and makes a home system), then just buy the original MVS arcade cartridge. You can also play the game on a computer emulator. Conclusion: Man, is this game great! It looks fantastic – everything is big, bright, and extremely colorful. It definitely has a Japanese feel to it. The different arenas you play in each have their own personality, like a disco-tech or a dojo, complete with enthusiastic background characters. The specials and Super Attacks look amazing, with large explosions and other effects that add to the magnitude of the attacks. The 8 difficulty settings really help the game’s overall score. 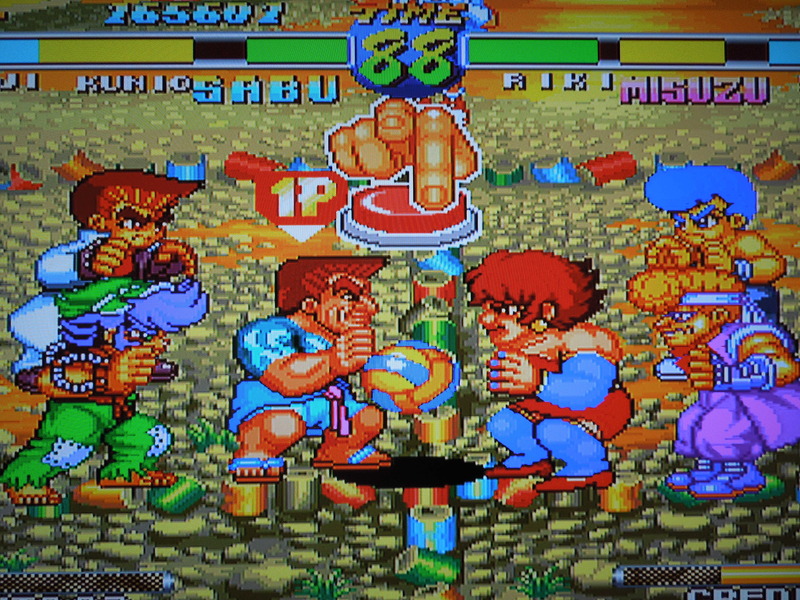 Some Neo Geo games are notorious for being too difficult, but with this one, you can easily beat the game if you want to, or you can practice and try to tackle the game’s toughest setting. 2 player VS is great fun, but you’ll want to let your opponent practice with the special moves first, otherwise you’ll decimate him or her quickly. 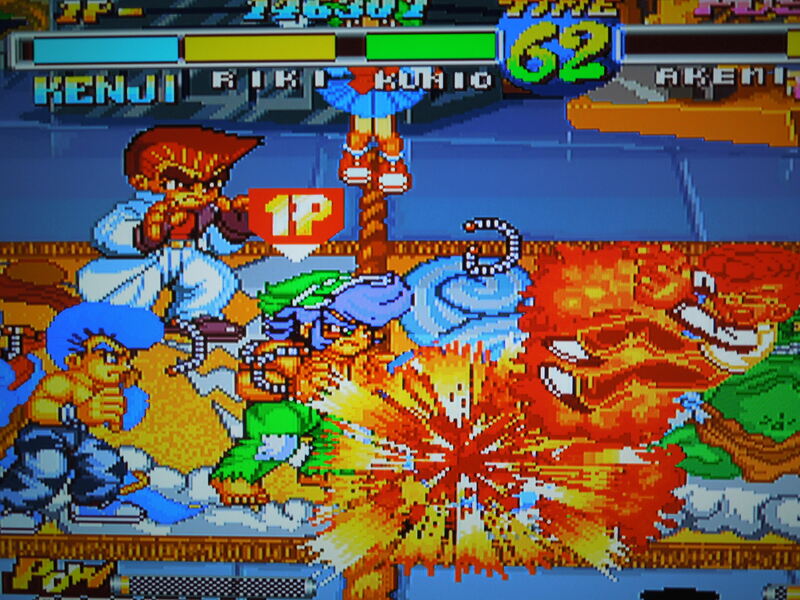 This game is one of the reasons the Neo Geo is considered one of the top game consoles of all time. It’s a shame this game is not more widely known. You’ll face D. Maou in the final match. 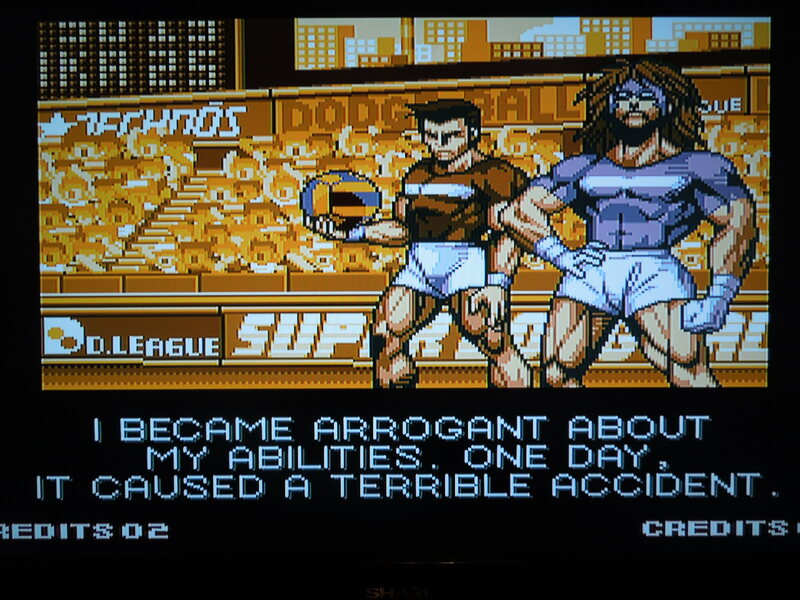 This entry was posted in Neo Geo - Super Dodge Ball and tagged Super Dodge Ball Review (Neo Geo AES). Bookmark the permalink.